CATHOLIC GIFT SHOP LTD - Brown Scapular Our Lady of Mount Carmel and the Sacred Heart of Jesus. 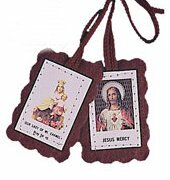 Our Lady of Mount Carmel and the Sacred Heart of Jesus brown Scapular measures approximately Size: 2" x 1 1/2" with leaflet. Brown Scapular translates as the following below. Sacred Heart of Jesus Have Mercy on Us. Our Lady of Mount Carmel Pray for Us.